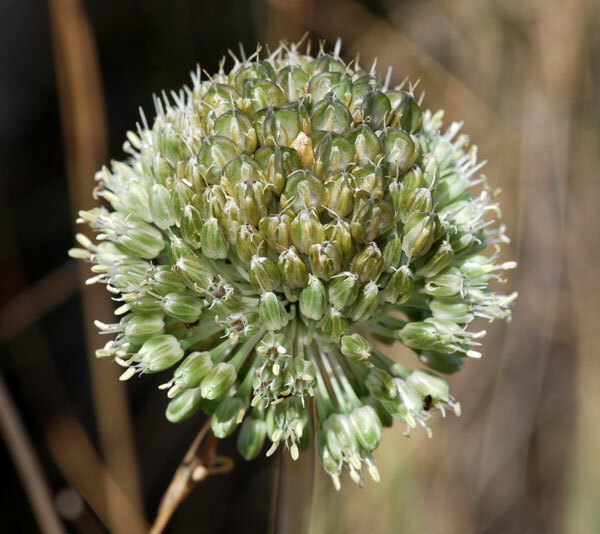 Early rains, particularly in the west of the island meant that the blooming of some autumn species was particularly early. A trip over to the White Mountains and Elafonissi was a delight, as it was our first chance to see C. graecum this year. Crithmum maritimum / Rock samphire - The young leaves are picked and salted or pickled to provide a relish. When crushed the leaves smell of tar or petrol. It can also be found in Britain on sea cliffs. 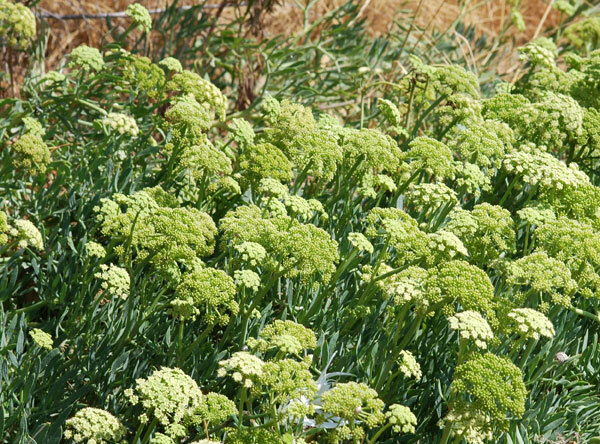 Crithmum maritimum is found in coastal areas around Crete. 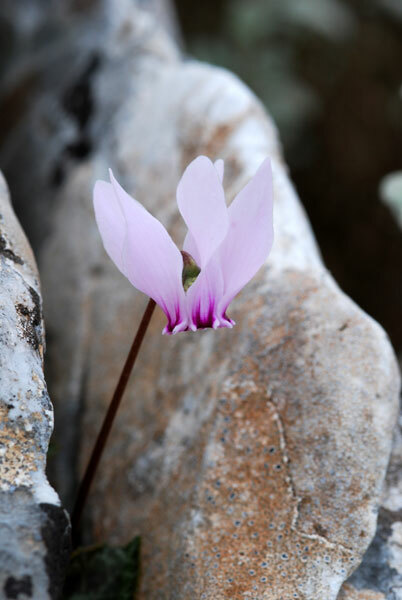 Cyclamen graecum / Greek sowbread - Cyclamen graecum is not found east of Elounda and is more frequent in central and west Crete. 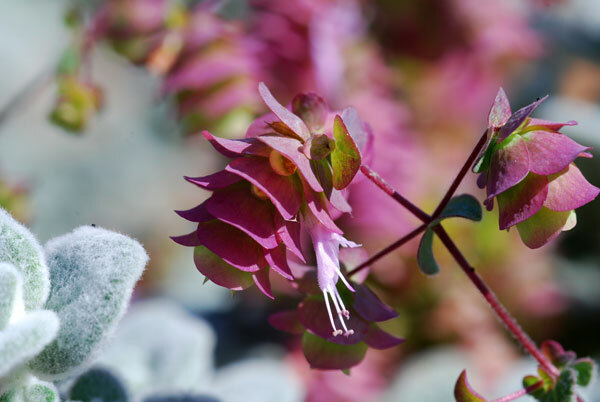 It is greatly admired for the variety of patterns to be found on its leaves and for its beautiful fuschia pink flowers. Occasionally a pure white example can be found – Cyclamen graecum sps. Candicum. Picnomon acarna - As this plant dies back it takes on a lovely golden colour, as can be seen in this photograph. The dried plants can persist for many weeks on roadsides and elsewhere. Euphorbia paralias / Sea Spurge - In Britain, this is the first plant that establishes itself on secondary dunes. During the last war the Russians did a lot of experiments with it to produce rubber from its milky latex. In Crete, it is widespread in coastal areas. 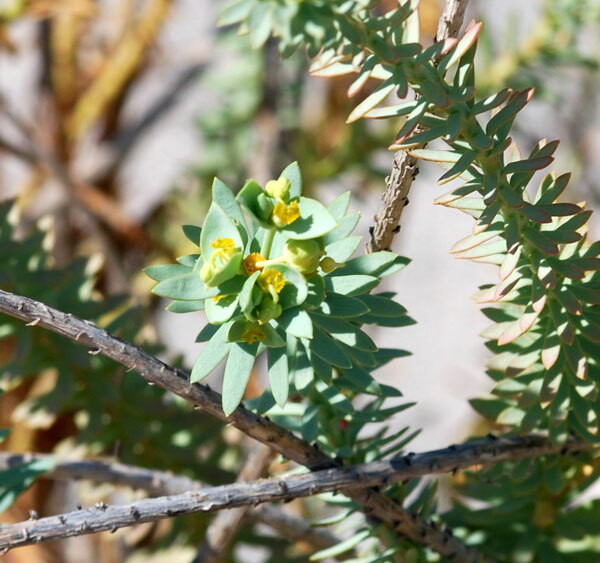 Like all euphorbia it is poisonous and its milky sap can cause skin irritation and burns. 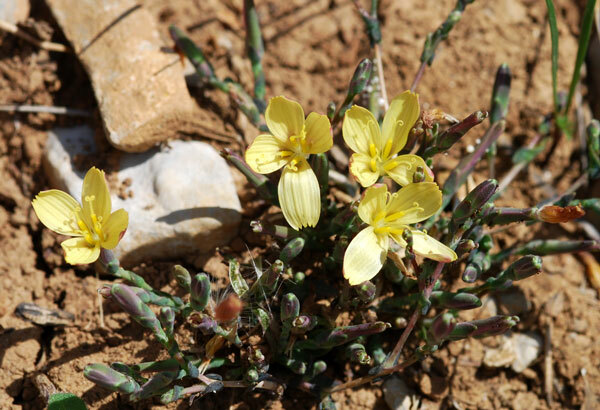 Lactuca (Scariola) alpestris - This mountain lettuce is a perennial found mostly in the mountains. This specimen was found above Kroustas en route to the Katharo Plateau. Old Olive Tree / Olea europea sps oleaster - This olive tree can be found in an ancient grove in western Crete near the remains of a Minoan settlement. 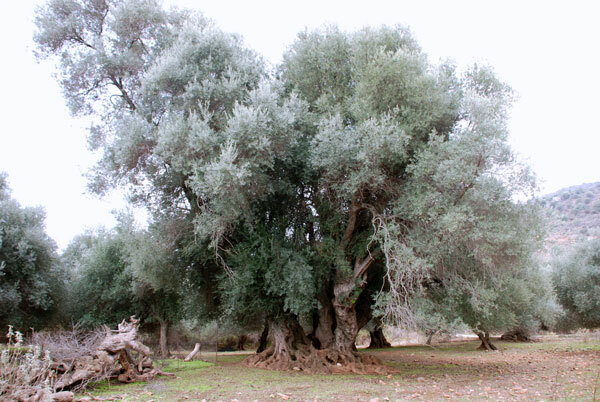 This tree has recently been dated by the radius of its trunk and the spread of its canopy as 3,000 years old making it one of the oldest olive trees in the world. Ononis spinosa ssp. diacantha / Spiny Restharrow - Restharrow is so named in Britain because it was so tough that when caught on harrows (used to break up the soil) it caused the horses to come to falter and stop. The subspecies shown here is a Greek endemic. Origanum dictamnus / Cretan Dittany - This beautiful specimen was photographed in cultivation at BioAroma Essential Oils Factory in Aghios Nikolaos. 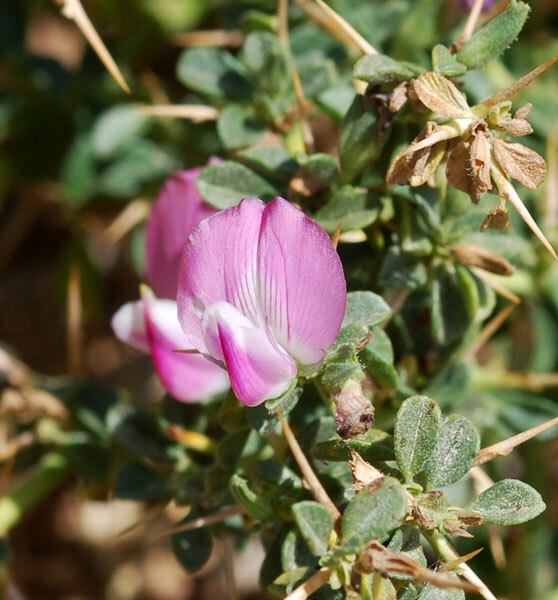 Cretan dittany is famous around the world for its medicinal properties. 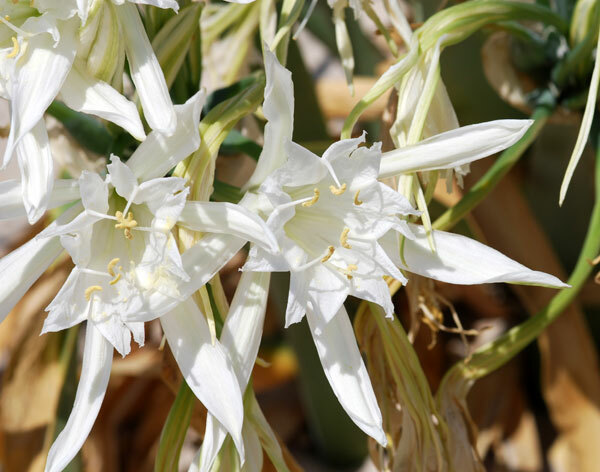 Pancratium maritimum / Sea Daffodil - The sea daffodil can be found on the sea shore in many places around Crete and is so beautiful that it is now cultivated in the grounds of several luxury hotels. Its perfume is sweet and heady and altogether this must be one of the most attractive plants on the island.